This entry was posted in Teaching by Karen Zgoda. Bookmark the permalink. *Takes the bait* Sure, I would LOVE to hear about the research funnel! Scene: Research Methods, second week of class, 8am on a frigid Friday morning. Research methods is my favorite course to teach. Setting the Context for Learning: As Zora Neale Hurston wrote, “Research is formalized curiousity. It is poking and prying with a purpose.” Or as Carl Sagan wrote, “Somewhere, something incredible is waiting to be known.” Research is a process that we undertake to ensure our clients have the best possible treatments, policies, programs, etc. Research is a language we can use to demonstrate the value of the work we do. It is a process by which we put together our best ideas and methods to lead to new discoveries and conversations in our field about the work we are doing, driven both by the needs and concerns of our clients and previous research. This approach is designed to ease anxiety about the research process and generate excitement about discovery and immersing oneself into a topic with the goal of helping people. Topic: We’re introducing the research process and how we find research, ultimately leading to the development of a research proposal. 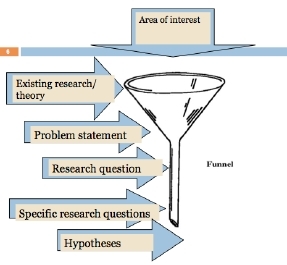 Lecture: The research funnel (source unknown). We start with a broad area of interest, and eventually narrow it down based on available research and refinement. 1. What you are passionate about in your work? 2. What bothers, worries or confuses you most? 3. Particular populations you are interested in. 4. Hot issues in your area of practice? My pleasure – glad you found it helpful! I love it Karen. I can tell you are an awesome research methods teacher, the description is so clear. And the group activity sounds like it would really help to engage students and to help them see the importance of research for practice.